This is a small open space preserve near Los Gatos. The trails in the preserve reach all the way to a clearing atop the hill by the same name, providing some views (both from the top and along the way there) to the southern reaches of the Santa Clara Valley and to the Lexington Reservoir. The route shown on this page might represent the longest ride you can do here without completely exhausting the trail variety that the park provides, though there's nothing to stop you from repeating some of the trails as many times as you like, of course, or from connecting to other trails in the nearby Sierra Azul Open Space or extending your ride around the reservoir. Basically, this is a good training ride option for the locals, but not a riding location to attract people from other parts of the Bay Area. There are only a few climbs on this ride, but they are all steep. Actually, one is "crazy steep". But, once you leave those climbs behind, there's no more serious climbing within the small "main lattice" of the trails in this park (with the possible exception of taking Novitiate Trail eastbound). This particular ride starts by parking in downtown Los Gatos. That's not your only option. You can also park much closer to the entrance of the park. There's some parking right across from the trailhead that enters the park. The reason I park in Los Gatos is out of habit more than anything else, though it does also extend the ride a little and allows me to add the northern stretch of Jones Trail to the ride, in addition to providing the benefit of not having to drive more and park again if you want to grab a bite at the end of the ride. The choice is yours. You might opt to shoot for parking closer to the entrance first, and leave the downtown Los Gatos parking as a backup option, for instance. The suggested parking location I've linked to on this page is just street-side parking in town. There are also multiple free public parking lots around downtown Los Gatos, though they fill up quickly on nice weekends. With metered parking, watch out for time limits. Basically, you might have to circle around a little bit before you find a place to park. The ride initially takes the Los Gatos Creek Trail up toward Lexington Dam. This is a wide gravel path that is hugely popular with a wide variety of trail users. You might need some patience as you cover this portion of the ride on a crowded weekend. There's only a single notable burst of climbing along this stretch of the ride (beyond the gentle ascent of the trail on average). It's a short slope where the grade reaches something like 20% for a couple of hundred feet. There used to be a "walk your bikes" sign for this stretch in the downhill direction, which disappeared a while ago and hasn't been replaced since. But the steep spot is over before you know it. When you reach the dam, the route takes you climbing somewhat diagonally up and across the "face" of the dam. This is less than an 800-foot-long climb of up to 13% grade. After you reach the road atop the dam, the trailhead where you enter St. Joseph's Hill is a very short distance from there on your left. Entering the park from here throws the park's worst climb at you first. I'd be surprised if this climb doesn't have the nickname "The Wall" among some riders, though I haven't heard it yet. Its lowest section is paved for a little while, which also happens to be the steepest part of it. If the grade doesn't reach 30% here, it's at least very close. The climb continues to be brutal after that for another few hundred feet, but not at that level. When you turn right at the end of this climb to ride through the 0.2-mile connector trail to reach the "main lattice" of trails in this park, you'll notice that this brief section, too, is a pretty serious climb. It reaches into something around 25% grade again. But this is the last one. 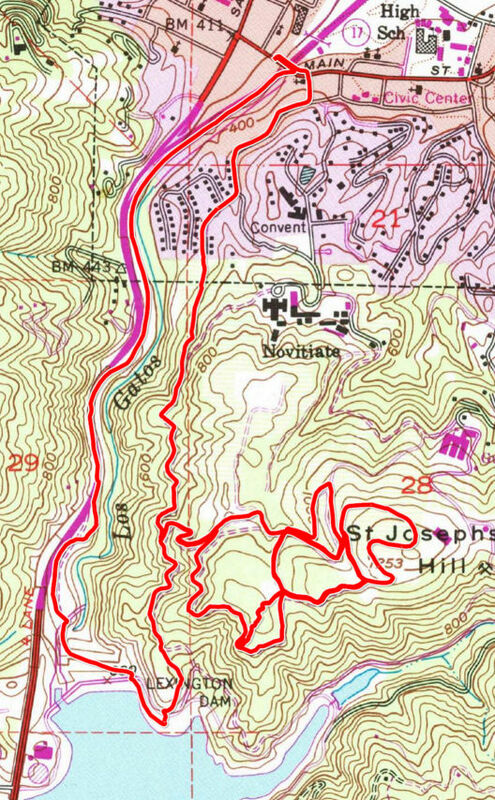 Beyond this, the climbs in most of the short interconnected trails at St. Joseph's hill are quite moderate in grade (with the possible exception of parts of Novitiate Trail, as I mentioned above). The trails in this part of the park are so short and so interconnected that they don't lend themselves to a particular recommended route. What you'll more likely be doing is weave in and out of the same trails multiple times, repeating loops, returning to ride some of the same trails in the opposite direction, etc. In fact, that is roughly what I have done on this particular ride. So, it would be useless for you to try to follow the exact turns of the GPS track on this page. Just improvize and try out as many of the trails as you can, until you run out of time. Or, of course, leave the park earlier and connect to another trail to ride somewhere else nearby. There are a couple of trails that might be worth mentioning, though. Serpentine Trail must be the cutest trail here. It's a very short (less than a quarter mile) singletrack, but it's fun due to its very tight and playful twists. It's more uphill in the northerly direction. Upper and Lower Brothers Bypass trails are also "singletrack-like", but they're featureless in comparison to Serpentine. The "Lower" one at least presents good views as it follows mostly flatly along a hillside. But, again, all of these are all so short as to be over before you know it. The rest of the trails in the park are all fire roads. One interesting note might be that the name "St. Joseph's Hill" dates back from a time in the region when a movement aiming to Anglicize the predominantly Spanish-based place names here had some amount of following, according to what I remember reading somewhere. "St. Joseph" is essentially "San Jose", in other words.